Mercedes Bluetooth HFP Adapter: This is the genuine Mercedes Bluetooth HFP adapter for cars the exchangeable cradle phone system. It is the latest version which supports the latest Nokia phones etc. 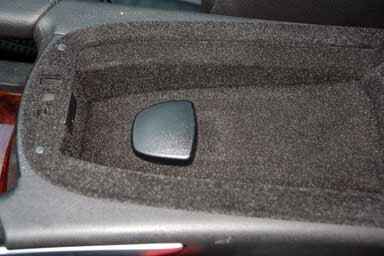 These items are supplied brand new, in a Mercedes box with the proper manual. If you are supplied one without the manual in the box then you should question its authenticity and whether it is indeed new. There are sellers who are passing off old stock as new. Make sure you get the latest part number and the unit is boxed with its manual. If not, it isnt new! 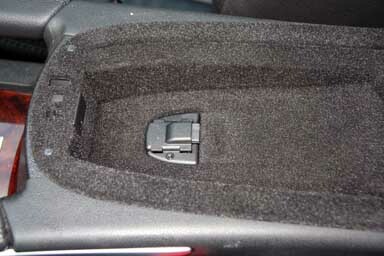 The Mercedes Bluetooth HFP phone adapter connects to the phone cradle connector which is normally under the cover normally in the centre arm-rest glovebox, if your car has phone pre-wiring. 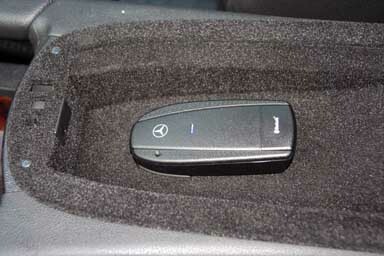 It is the most cost-effective genuine Mercedes Bluetooth cradle. The Bluetooth HFP adapter then connects via Bluetooth to your phone and you can make calls via the steering wheel controls and COMAND if you have it on your car. As it supports PBAP it should now work with the latest Nokia smartphones properly. Apple Iphone 4/4S with V4.1 or later software. The Mercedes Bluetooth HFP adapter will not work in cars with the old CD based COMAND system, or Audio-30, Audio-30-APS, Audio 10-CD or Audio-10 Casette because you get echo on the system. As it uses your phone's aerial, it should not be used in cars with heat reflective glass as that blocks the phone signal (you need the Bluetooth SAP cradle, or a ViseoO plus a 6310i cradle, depending on which phone you have and whether you have heat reflective glass). The HFP cradle does not support sending/receving SMS messages via COMAND. Last model S/CL with COMAND APS system where the map DVD goes in the boot (i.e from MY2004 (built Sept 2003) onward). SL with COMAND APS (Map DVD goes in the boot) or Audio-20 CD (i.e from MY2005 (build July 2004) onward). G with COMAND APS system where the map DVD covers all of Europe or Audio-20 CD(i.e from MY2008 (build April 2007) onward). Latest VITO with COMAND APS system where the map DVD covers all of Europe. Current SLK without inbuilt blutetooth. This adapter is NOT approved for USA or Canada although it does work - please see our ViseeO MB-4 for USA/Canada. If your car has a fixed Nokia 6xxx system, please see our Viseeo MBU-3000 product. W211 (E class) Nokia 6310i cradle with curly cable. "Thanks for your help, Mark - excellent and prompt service." "It works!!! You are the best!!!!! Thank you."